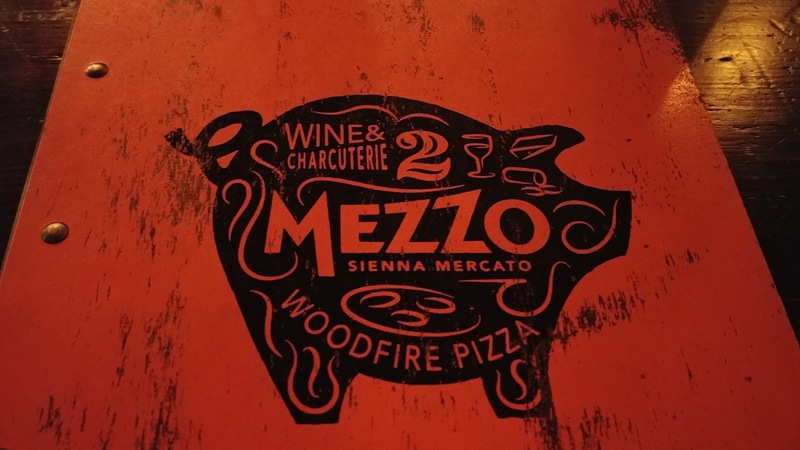 It had been a while since we last dined at Mezzo, the middle floor of Sienna Mercato (Emporio is on the first floor, Il Tetto on the top floor). Last weekend, our Saturday Dinner Date was at Mezzo. To be honest, it didn't start out so great. We made our reservation 1-2 months ago through OpenTable, and as usual, we mentioned that one person is in a wheelchair in the special request/note area. It turns out the only 2 person tables on the main level of Mezzo are at the top of the stairs, with the only unoccupied one when we arrived being right at the top of the stairs. The other 2 person tables are down a few steps. We didn't realize this because on our last visit, we were with 2 other people. I was not happy about being at the top of the stairs, where people would be looking right at us as they ascended and then as they waited to be seated, they'd be standing right next to our table. I didn't understand the issue with the table at first, but it turns out that neither the width nor length is sufficient to allow my very small width wheelchair to actually roll completely up to the table. They offered to acquire a table from downstairs that would be more accommodating and went off to fetch it, but it turned out that the table was in use. I was not at all happy because we had made the reservation so far in advance and specified that one person was in a wheelchair. Apparently, no one looked over the reservations in advance or prepared in advance for a wheelchair patron. But what were we supposed to do? It was a rainy Saturday night in the city. I didn't feel like walking around in the rain looking for a restaurant that could seat us on the spur of the moment, especially knowing that post-afternoon and pre-evening Wicked performance ticket holders would be crowding restaurants around this time. I was hungry, and damp, and annoyed. So I sat at the table, not close enough to be comfortable, having to lean forward/have no back support for the evening when we talked/ate. Then, as I was still fuming a bit, our server came to take our drink order, but I hadn't had a chance to look at the wine menu, so we asked for some time. That turned out to be a lot more time than we expected, so we were becoming even more unhappy. Fortunately, things got better from there and the food was as tasty as we remembered. Shrimp Fritters (espelette pepper, lemon emulsion). 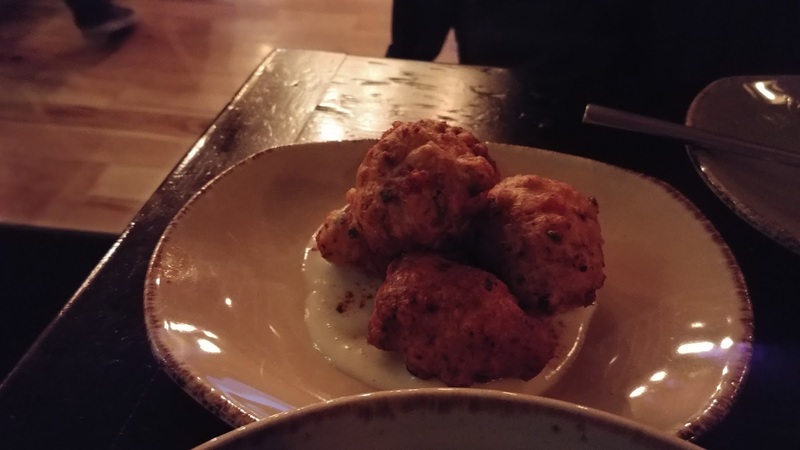 These were a lot lighter than I expected and the lemon emulsion was fantastic. Really tasty. 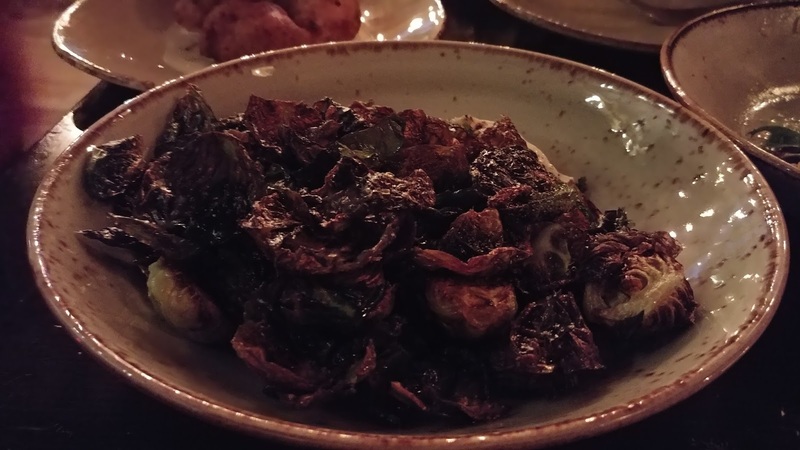 Crispy Brussels (apple cider and ginger glaze, smoked maple goat cheese). We almost always order crispy Brussels when we're out and they're on a menu. The ones we make at home are never as tasty. These were yummy, nice and crisp. I liked but didn't love the smoked goat cheese, which surprised me because usually I gobble up anything with cheese. SP really liked it. 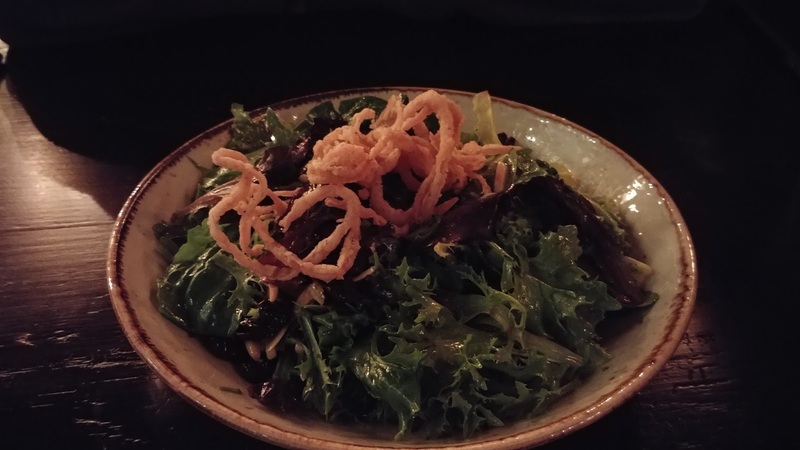 More veggie: Mixed Greens (white balsamic vinaigrette, dried cherries, almonds, crispy fried onions). I like the salads we make, but somehow they're never quite as tasty, quite as "just right" as the ones when we dine out. Just the right amount of dressing and goodies in with the fresh greens. 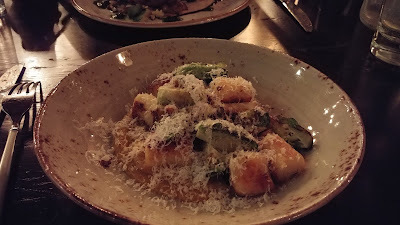 I opted for a medium plate as my main meal: Ricotta Gnocchi (carrot purée, rosemary, brussels, pine nuts). I love gnocchi. We do not make it at home so it's a treat and I knew I'd likely be a little too full for a large plate (plus, dessert was on my mind). Just the right size for me, and yummy. 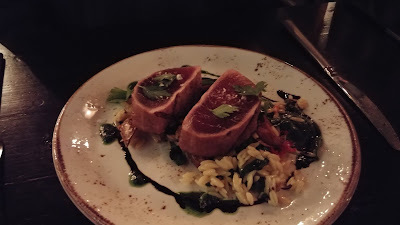 SP chose Grilled Tuna (orzo, wilted spinach, fingerling potato, calabrian chili, parsley). He said it was delicious. We both ordered decaf coffee and shared a dessert: Almond Affogato Roulade (bittersweet chocolate sauce, toasted cocoa almond). I wasn't sure what to expect. Affogato makes me think ice cream and espresso. Roulade makes me think a rolled (spiral) jelly roll cake like pumpkin roll. Our server said it was more like a tiramisu, so we decided to try it. 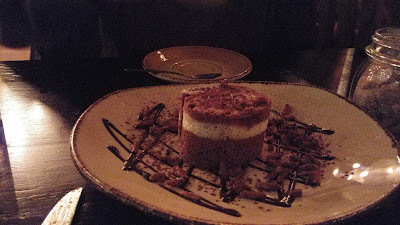 Delicious light, spongy cake with chocolate-almond crunchy bits on the plate. Really good, and just right for us to share at the end of the meal. We really enjoyed our food. Dishes were very promptly cleared from the table. I just wasn't happy with the table size and location. I think next time, we'll go with family or friends so that we can be at a larger table that I can more comfortably fit at and that isn't right by the entrance area.